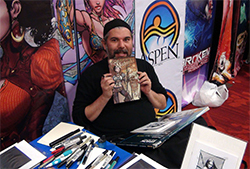 Joe Benitez is an American comic book artist who has worked on such titles as JLA, Superman/Batman, Detective Comics, Supergirl, and Titans for DC Comics and The Darkness for Image Comics. He also co-created and penciled the sci-fi series Weapon Zero and the dark fantasy mini-series Magdalena: Blood Divine for Image. In 2005, Joe published his first creator-owned mini-series Wraithborn through Wildstorm. In 2009, he stepped in to finish up Michael Turner's run on Soulfire. Joe is currently working on a new creator-owned book, Lady Mechanika.